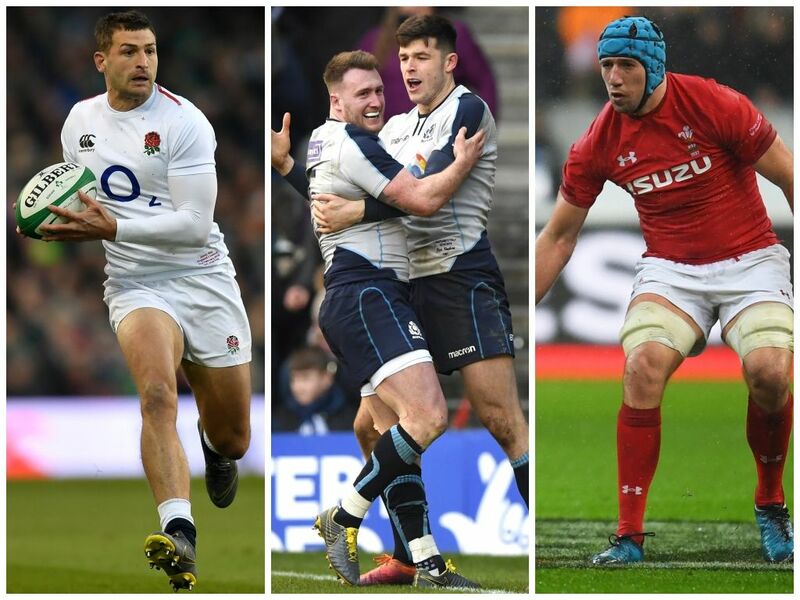 With the dust having now settled on Round One of the Six Nations, we take a look back over the three opening games to select our Team of the Week. 15 Stuart Hogg (Scotland): Was a key contributor as Scotland moved into a 33-3 lead against Italy on Saturday, with his smart running lines and kick returns causing the Azzurri all kinds of bother. He finished with a try, assist and 11 carries for 126 metres to see off Elliot Daly, who silenced his doubters as a Test level 15, and also Liam Williams, who was a threat at the Stade de France on Friday. 14 Jonny May (England): An incredibly tough call to leave George North out of our team after his two-try showing but we simply had to find space for May, with this his best performance in an England jersey. The Leicester wing was everywhere in Dublin with a fired-up shift seeing him impress both defensively and in attack as, like the aforementioned Hogg, he contributed a try and assist in his team’s opening win. 13 Henry Slade (England): Speaking of enjoying an excellent day at the office, Slade can also be happy with his showing at the Aviva Stadium as he crossed for a brace of tries and looks to have transferred his club form to the Test game. An intelligent centre who has pace, a wicked step and strong fend in contact, his battle with Garry Ringrose was always going to be absorbing and he came through it well. 12 Manu Tuilagi (England): A close call as Sam Johnson was excellent on debut for Scotland, however tougher games are sure to come for the Glasgow man. Tuilagi though returned for his first England start since 2014 and made quite a statement at centre from the off, running hard and straight to put Ireland immediately on the back foot. If, and it is a big if, England keep him fit, they have a devastating 12. 11 Blair Kinghorn (Scotland): Kinghorn made history on Saturday by becoming the first Scotsman to grab a hat-trick in the Six Nations, the first for Scotland in the Championship since 1989 when five teams were involved. His first two scores were run-ins but the try that saw him complete his treble showed real quality as he bought time in possession. He must now continue this form in the coming matches. 10 Finn Russell (Scotland): Owen Farrell misses out here but impressed as a leader for England in Dublin. He definitely got the better of Jonathan Sexton while other rivals for our 10 shirt struggled over the weekend. Not so Russell, whose confident showings for Racing 92 continued in the Test fold. A lovely cross-kick for Kinghorn’s opener was the start of a tidy, classy performance at Murrayfield. 9 Ben Youngs (England): There had been pressure on Youngs after an indifferent start to the season at club level but he was impressive for England, kicking and organising well as his pack showed their mettle. Morgan Parra was superb in the first 40 in Paris but, like France, dropped off in the second, while Tomos Williams was the closest rival to Youngs after showing up well for Wales. 8 Billy Vunipola (England): Came out on top in his direct duel with Ireland hardman CJ Stander, who also impressed before being forced off the field through injury. Although he wasn’t his usual destructive self on attack, Vunipola was a willing ball carrier, gaining 23 metres from 10 carries which included three clean breaks and a couple of offloads. He also shone on defence with 11 tackles. 7 Justin Tipuric (Wales): England’s Tom Curry and Josh van der Flier of Ireland were involved in a battle royal in Dublin but Tipuric gets the nod after a superb performance for Wales against France in Paris. As usual, the Ospreys man was a nuisance at the breakdown but it was an excellent defensive effort which caught the eye as he finished with 18 hits. 6 Mark Wilson (England): Another player who makes our team after a brilliant defensive display. Wilson did not do much with ball in hand but played a huge role in keeping Ireland’s attackers at bay, making 27 tackles in the process which was a joint team high. Also made his presence felt in the loose especially with his clean outs at the rucks. 5 Alun Wyn Jones (Wales): The Wales captain impressed with his leadership in difficult conditions in Paris and came to the fore strongly in the second-half when his side launched a stunning fightback. Jones also did well in the line-outs and put his body on the line on defence with seven hits. James Ryan also got through plenty of work for Ireland. 4 Maro Itoje (England): Left the field early in the second-half due to injury but the Saracens stalwart emptied the tank during his stint on the field. He did not take a backward step in a bruising physical battle and made a nuisance of himself, especially when putting pressure on Ireland scrum-half Conor Murray. Itoje also impressed on defence and eventually made 10 tackles. 3 Tomas Francis (Wales): Wales’ forwards deserve plenty of credit for the way they fought back against a monstrous France pack and Francis was at the forefront of that effort as he put in a huge shift before being replaced midway through the second-half. Stood up strongly in the scrums and also defended well, finishing with seven tackles made. 2 Jamie George (England): Wales’ Ken Owens is unlucky to miss out after impressing against France but George’s performance against Ireland was excellent and he gets our vote. George did well in his core duties with his line-out throw-ins and scrummaging superb throughout. Was one of England’s stars on defence and made 18 hits. 1 Mako Vunipola (England): Another one of England’s heroes from Dublin, the older Vunipola was named the official Man of the Match after delivering a superb all-round effort. Got the better of Tadhg Furlong in the scrums and ran hard, gaining 15 metres from 11 carries. But it is his prowess on defence which stood out and he finished the match with an incredible 27 tackles made.